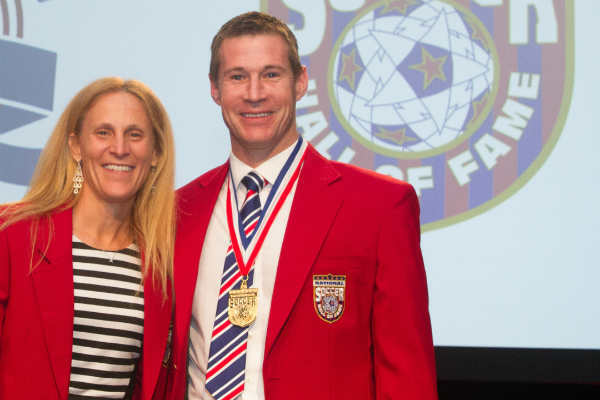 By Charles Boehm – WASHINGTON, DC (Feb 17, 2015) US Soccer Players – Brian McBride, Bob Bradley, and Kristine Lilly were inducted into the National Soccer Hall of Fame during the US Soccer Federation’s annual general meeting in San Francisco on Saturday evening. It was a richly deserved tribute to three icons of the game’s renaissance era in the United States. According to what a US Soccer spokesperson said was “due to multiple factors,” the delayed induction of the class of 2014 occurred in a hotel ballroom rather than at a National Team game. Even among Hall of Famers, this trio’s careers stand out, spanning a transformative period in North American soccer. As the sport crossed one tipping point after another on either side of the new millennium’s arrival, they honed their crafts within the confines of the domestic scene, then eventually found their way to new achievements on new frontiers. Much is made of the need for fundamental, systemic change at the grassroots of American soccer. There’s little denying that the manner in which this country cultivates world-class players (and coaches) remains too inefficient. McBride and his Hall of Fame classmates showed that reality to be a challenge, not a crippling limitation. McBride in particular might just have built the prototypical modern career track for a top US soccer player. The striker turned heads as a college standout at St. Louis University via an eye-popping 72 goals and 40 assists in 89 games. He then overcame an abortive stint at Wolfsburg in Germany and made history as the first-ever draft pick in MLS history. The steady climb continued from there. He proved himself a dependably dangerous target man with the Columbus Crew before vaulting into the English spotlight with loan stints at Preston North End and Everton that set him up for a permanent move to Fulham. His exploits along the River Thames will be quite familiar to most USMNT fans, with a few successful relegation escapes and an eponymous in-stadium pub providing a legacy nearly as stirring as any trophy. Throughout that climb, McBride remained refreshingly grounded, always hungry for opportunities to learn and improve. The NCAA scene finds few defenders nowadays, but as he prepared for his Hall of Fame bow, he made clear how much his four years at SLU benefited him. Like many Yanks abroad, McBride and his fast-growing family longed for home as his career wound down. He returned to his native Chicago to give back a few more years (and goals) to MLS. His decision to join the hometown Fire instead of the Crew stung many Columbus fans. Their frustration was more a sign of the universal respect he’d earned than any sin on his part. McBride, who recently concluded a broadcasting stint with Fox and transitioned into an executive role with a human-resources startup, still lives in the Windy City and had pledged to remain close to the beautiful game. He’s already spent time as a part-time assistant on the Fire’s coaching staff. He was also part of a five-man committee that advised Fulham on the selection of their new manager last year. Hopefully that means USMNT fans won’t have to wait long to see him contributing to the cause yet again. Bob Bradley continues to live out a similar trajectory in a field where Americans tend to encounter even tougher sledding. After paying his dues as a college coach, then an assistant at the pro level, he made the most of his first big-time gig, leading the Fire to an MLS Cup title in their expansion season – a feat which has yet to be repeated, and probably won’t be. Bradley overcame a trying, tumultuous time with his local club, the MetroStars, by leading the league’s redheaded stepchild Chivas USA to the greatest success of its star-crossed existence. When the chance came to join the USMNT setup, he put in a similar grind. When the Federation’s initial negotiations with Jurgen Klinsmann broke down in 2006, Bradley took the head coaching job on an interim basis. He paid that awkward situation no mind, earning the job on a permanent basis with quiet resolve – and results. The USMNT’s gripping run at the 2010 World Cup left everyone – Bradley included – wanting more. US Soccer gave him another new contract only to summarily dismiss him a year later when Klinsmann took the job. Bradley handled another difficult sequence with astounding grace. Much like players who look abroad for inspiration when they outgrow the domestic scene, he took one of the toughest jobs in world football. Bradley brought Egypt agonizingly close to the 2014 World Cup despite chaos and violence all around. His journey continues to this day as the Stabaek boss seeks European heights never before reached by a US coach. There’s insufficient space here to delve into the full scope of Kristine Lilly’s achievements. With 352 caps, no human on earth has represented their country on a soccer field more often than she did. Her dedication to the USWNT matches a deep commitment to her craft. Lilly played both home and abroad at the club level, balancing her quest for personal progress with the imperative of supporting the now-defunct WUSA and WPS pro leagues. US soccer still has a long way to go, both on the field and in the wider American culture. Still, that that journey has grown far, far less burdensome after Brian McBride, Bob Bradley, and Kristine Lilly redefined our understanding of what’s possible.